How unlikely was the twenty round shootout between the Capitals and the Panthers? Last Tuesday, the Florida Panthers defeated the Washington Capitals in the longest NHL shootout ever. It was a grueling, twenty-round battle that dwarfed the previous record. The previous record for longest shootout, which only lasted fifteen rounds, took place in 2005 between the New York Rangers and the Capitals. Just how incredible was the shootout marathon between Washington and Florida? Shootouts themselves aren’t terribly rare; there have been 1409 since the league instituted them for the 2005-06 season. Between the 2005-06 and 2013-14 seasons 13.3% of games have been decided by shootouts. The majority of those shootouts have been resolved in the first three rounds. If the score is tied after the first three rounds then more rounds are added until one team scores and the other misses. 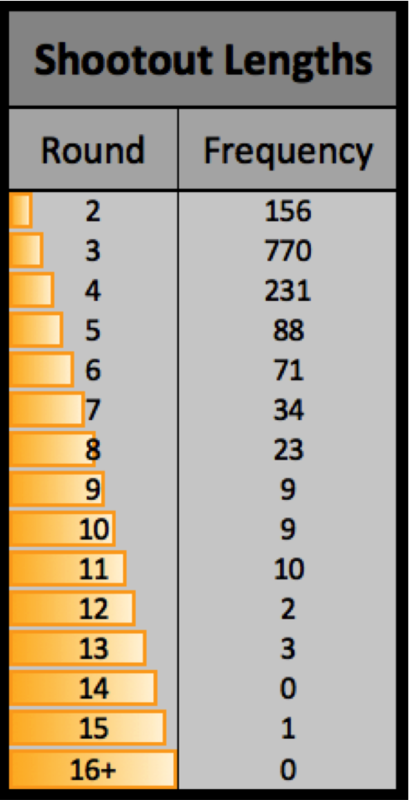 Here is a table that counts the number of shootouts that reached up to fifteen rounds (the previous record). The number of shootouts drops rapidly as the number of rounds increases, and barely any last more than eight rounds. Again, this data includes all games between the 2005-06 and 2013-14 (previous) season and thus does not include this season’s data. *Note: A shootout can end after two rounds if one team leads by 2-0 at the end of the second round (leaving no room for a comeback and resulting in an automatic shootout win). 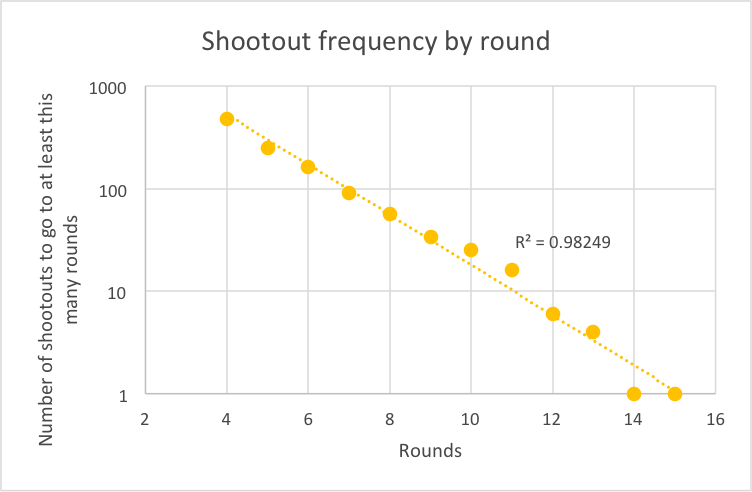 This relationship of the number of shootouts that reach a particular round can be better described graphically. The following graph only shows shootouts that went to at least the fourth round, because the shootout rules change to sudden death after the third round. The y-axis is on a logarithmic scale. A function of natural log fits the plot quite well. Based on the trend line, the probability that any particular game will end in a shootout lasting twenty or more rounds is 0.00112%. If we extend this relationship, we predict that, with 1230 games in a season, we can expect a shootout like the one on between Florida and Washington to take place about once every seventy-two seasons. So, how rare was Tuesday’s shootout marathon?